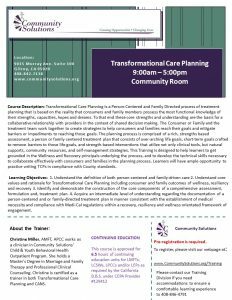 Transformational Care Planning is a Person-Centered and Family Directed process of treatment planning that is based on the reality that consumers and family members possess the most functional knowledge of their strengths, capacities, hopes and dreams. To that end these core strengths and understanding are the basis for a collaborative relationship with providers in the context of shared decision making. The Consumer or Family and the treatment team work together to create strategies to help consumers and families reach their goals and mitigate barriers or impediments to reaching those goals. The planning process is comprised of a rich, strengths based assessment, a person or family centered treatment plan that consists of over-arching life goals, short-term goals crafted to remove barriers to those life goals, and strength-based interventions that utilize not only clinical tools, but natural supports, community resources, and self-management strategies. This Training is designed to help learners to get grounded in the Wellness and Recovery principals underlying the process, and to develop the technical skills necessary to collaborate effectively with consumers and families in the planning process. Learners will have ample opportunity to practice writing TCPs in compliance with County standards. 1. Understand the definition of both person-centered and family-driven care 2. Understand core values and rationale for Transformational Care Planning including consumer and family outcomes of wellness, resiliency and recovery 3. Identify and demonstrate the construction of the core components of a comprehensive assessment, formulation and, treatment plan. 4. Acquire an intermediate level of understanding regarding the documentation of a person-centered and or family-directed treatment plan in manner consistent with the establishment of medical necessity and compliance with Medi-Cal regulations within a recovery, resiliency and wellness orientated framework of engagement. Christine Miller, AMFT, APCC works as a clinician in Community Solutions’ Child & Youth Behavioral Health Outpatient Program. She holds a Master’s Degree in Marriage and Family Therapy and Professional Clinical Counseling. Christine is certified as a trainer in both Transformational Care Planning and CANS.